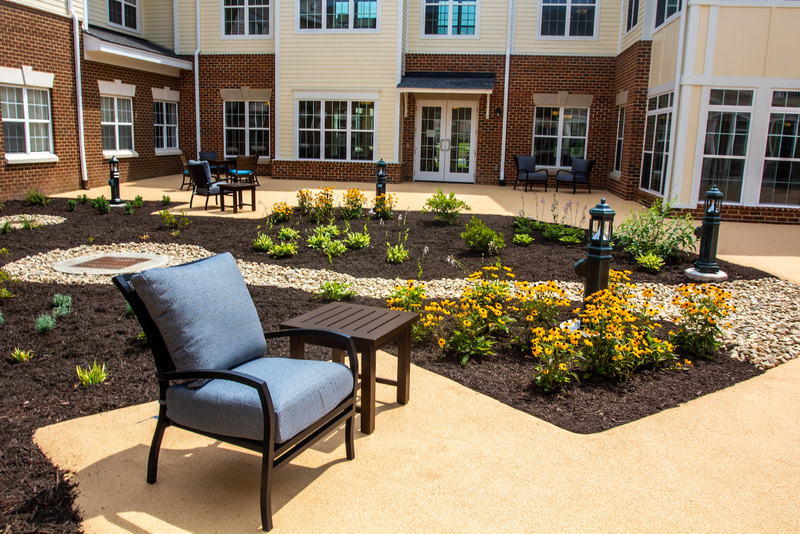 In a separate, secured neighborhood at Manor East is dedicated care for residents with memory impairments such as Alzheimer’s disease and dementia. The secluded, tranquil space provides private bedrooms, therapy areas, common spaces, an outdoor courtyard, and a dedicated entrance for family access. Meeting residents where they are through engaging programs. Our memory care programming focuses on creating meaningful connections through activities that engage the mind, body, and spirit. We recognize each resident has led a fulfilling life, and we encourage use of one’s current skills and help each resident stick to familiar, daily routines – hygiene, getting dressed, household tasks, exercise, and even watching favorite TV programs or movies. Art, music, and group gatherings are designed to stimulate memories, increase awareness and cognition, and decrease anxiety. Common areas and family-style dining also encourage positive socialization with others. The symbol of Covenant Woods’ commitment to lifelong care is Manor East, a dedicated, state-of-the-art healthcare wing offering engagement programs and comfortable care for memory care residents – and peace of mind for families.